Looking for some Gluten Free and Vegan dishes? 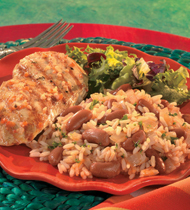 Try our Red Beans and Rice made with V8® 100% Vegetable Juice. This delicious healthy side is perfect for any menu. Vidalia onion, chopped	 2 lb. 1 1/2 qt. kidney beans, canned, rinsed, drained	 45 oz. 2 qt. cooked white rice	 79 oz. 3 qt. 1. Heat oil in sauté pan or large tilting skillet or rondo. Add onions, garlic and red pepper and cook until tender. 2. Stir in beans and vegetable juice. Heat to a boil. Reduce heat to low. Cover and cook for 10 minutes. 3. Stir in rice and parsley. CCP: Hold at 140°F. or higher. Portion rice mixture using 8 oz. ladle (1 cup). 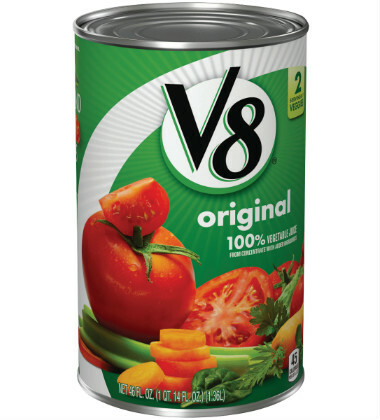 Chef Tip: Substitute V8® Spicy Hot or V8® Picante for the Vegetable Juice. Vidalia onion	 1.5 lb. 1 1/2 qt. kidney beans	 45 oz. 2 qt.